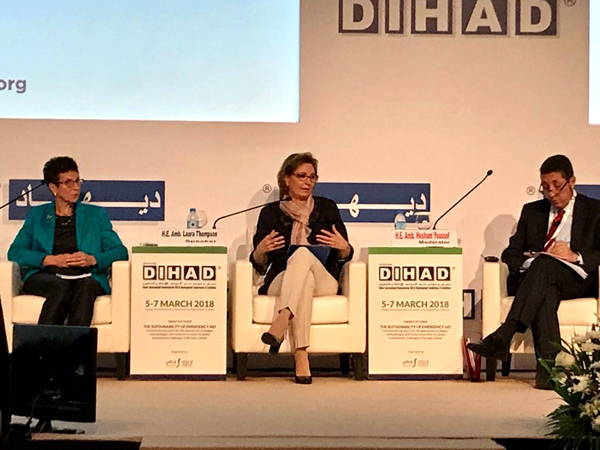 DUBAI, Mar 6 2018 - IOM Deputy Director General Laura Thompson yesterday (05/03) called for improved humanitarian financing structures at the 15th Dubai International Humanitarian Aid and Development Conference and Exhibition (DIHAD). Deputy Director General participated in the panel discussion Doing (Even) Better with the Resources in Hand alongside Ursula Mueller, Assistant Secretary-General for Humanitarian Affairs and Deputy Emergency Relief Coordinator, OCHA and Mohamed Beavogui, Director-General of the Johannesburg-based Africa Risk Capacity. During the panel discussion, moderated by Hesham Youssef, Assistant Secretary-General for Humanitarian Affairs, Organization of Islamic Cooperation, Deputy Director General Thompson highlighted four key areas. Firstly, she noted that despite reaching more people than ever before, current resources and humanitarian financing structures are no longer able to address the scale and complexity of today’s crises, let alone future needs. Secondly, she highlighted the need to ensure that each aid dollar has the maximum impact possible on saving lives, preventing suffering and helping communities become resilient. “IOM is uniquely placed to contribute to the global dialogue on reducing risks, needs and vulnerability,” concluded Deputy Director General Thompson. The three-day conference and exhibition opened on 5 March under the theme The Sustainability of Emergency Aid: The Intensifying Search for the Appropriate Strategies, Methodologies and Resources to Meet the Global Humanitarian Challenges in the Years Ahead. DIHAD, under the patronage of Sheikh Mohammed Bin Rashid Al Maktoum, Vice-President and Prime Minister of the United Arab Emirates and Ruler of Dubai, brought together global leaders and representatives from UN agencies, the UAE Red Crescent Authority, NGOs, procurement and logistics officials, researchers and others.